Always a delight to read your posts. Look forward to 2014’s additions. Thank you. I’ll work hard not to disappoint. I’m one of the Canadian readers. Keep it up! For all I know, you may be the only one… and you just visit often! Thanks for your faithfulness here (and for your own fine blog!). Your literary knowledge and well grounded insights are a welcomed stop. “Light” food for thought is tasty, but sometimes, you just want more. It doesn’t surprise me “Onions” remains popular. More than ever, individuals are feeling that’s a perfect way to describe life and people. That’s not to infer that all bloggers create refuse, of course! There are innumerable exceptions, a category I hope that Mere Inkling finds itself in. And, then there is your great column. I’m amazed at how frequently you are able to compose such entertaining, uplifting, surprising and humorous columns. Keep up the good work! I’m in California and happy to be on your map! Keep it up! 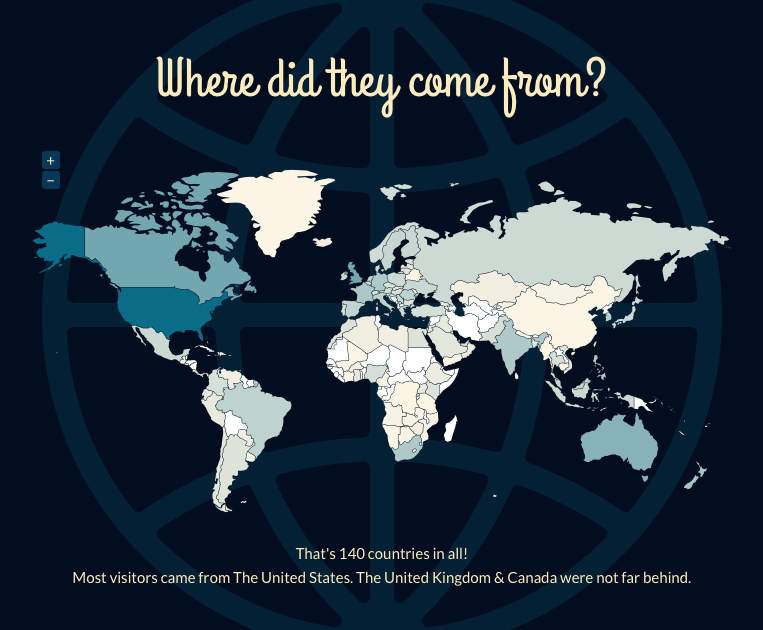 It’s fun seeing where your readers come from, isn’t it? And sometimes a bit scary to discover the search terms that brought them to your blog! Well, maybe not for you with your subject matter, but I find that to be the case with my farm blog. Trust me–you don’t want to know what I’m talking about! As for the search terms… I won’t ask. But yes, it certainly is interesting to see where readers come from. A happy and blessed 2014 to you and yours!